Cashew is a species of fruit tree that produces the cashew "nut" commonly found in stores around the world. However, despite its appearance, cashews are not actually nuts, they are seeds from their fruit. The fruit is unusual because shortly before the seed matures the pedicel (stalk) enlarges and becomes a sweet cashew apple. Another unique quality of cashews is an oil found in their shells. This oil is highly caustic and, if it contacts the skin, causes severe burns. For this reason, cashews must be carefully processed to obtain the delicious, well-known kernel that is enjoyed worldwide for its rich flavor. The cashew nutshell oil contains the same substance found in poison ivy and poison oak, which are members of the same family as the cashew, along with mangoes and pistachios . Cashews have male, female, and bisexual flowers borne on the same panicles. The cashew is an evergreen, tropical tree that usually grows about 40 feet high . The stem is short and gnarled, as are the branches. The branches spread very wide in an umbrella shape, and the tree's width may equal or exceed its height. In some trees, the branches may become too heavy, touch the ground, and put out secondary roots at the points where they contact the ground . The tree has large, leathery green leaves that grow 4 to 8 inches long and 2 to 3 inches wide . The simple leaves have prominent pinnate venation, smooth margins, and are oval to elliptical in shape  . In the dry season, flowers appear on 6 to 10 inch long panicles (clusters of racemes, which are similar to small branches) at the ends of the branches  . 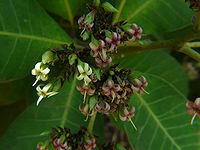 Flowering occurs from August to September in Brazil, while in southern India flowers appear from December to January . The tiny, clustered flowers begin as green and turn yellowish pink to reddish pink, sometimes with stripes . They each have five slender petals and are about 1/4 inches across . Dioecious (separate male and female) and monoecious (unisexual) flowers may be found growing together on the same panicle . The cashew "nut" is actually a dry drupe and is the fruit of the tree. Its double shell has an inner and outer layer, connected by a porous layer of tissue that contains a caustic oil . The outer layer of the cashew is called the exocarp, and the thick inner layer is the endocarp. The middle layer containing the toxic oil is called the mesocarp . The toxic liquid, called cashew nutshell oil, contains cardol, which is a urushiol (the same substance found in poison ivy) . The shell also contains smaller amounts of anacardic acid and other acids . The acids in the cashew shell are strong enough to cause dermatitis and severe burns to the skin, as well as the mucous membranes of the mouth and throat if ingested. Therefore, it is important that cashews be carefully shelled to prevent any of the oil from touching the seed. The seed inside the drupe, also referred to as the kernel, has two cotyledons, which is characteristic of dicot plants. It appears white and meaty before roasting . Since the cashew is technically a seed and not a nut, some people with nut allergies may still be able to eat cashews . Many people do not recognize the cashew nut as the fruit because of the cashew apple that develops after the drupe has grown to its full size (about 1 inch long) . This apple is referred to as a pseudofruit because it is not a true fruit. It is the peduncle (stem) of the drupe. The stem enlarges and becomes pear-shaped to form the apple, which may be yellow, red, or yellow-red when ripe . The skin of the cashew apple is waxy and the fruit is juicy and sweet with yellow pulp . The apple is edible but must be eaten fresh because it spoils too easily to be transported, usually within a day after being picked . The cashew apple requires about two months to ripen . It becomes ripe at the same time as the drupe, and they both fall off the tree together . The fruit is usually harvested after falling off the tree, and the apple and drupe are separated. If left on the ground in wet conditions, the seeds will germinate. Cashew trees reproduce sexually with seeds. The cashew flowers are pollinated by bats and many kinds of insects, but they are also capable of self-pollination because they have some monoecious flowers . After pollination, the drupe requires 6 to 8 weeks to mature, with the pseudofruit developing in the last two weeks of the ripening process . The cashew kernel, found inside the shell of the drupe, is the seed of the plant. When the drupe and pseudofruit are ripe, they fall off the tree together. If it lands in moist soil, the seed can germinate within 4 days of falling . 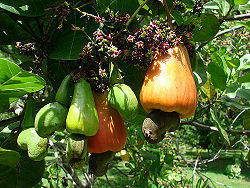 Commercial growers usually raise their cashew crops from seeds. They soak the seeds in water to aid germination and plant them either in a pit at their permanent location or in a planting bag to be transplanted once they have grown large enough . Two to four seeds are planted in each hole, and a month is allowed for germination and growth. The weaker seedlings are then removed, leaving only the strongest one to mature . Seedlings grown in planting bags are transplanted after two months to their permanent location, but this must be done carefully because their roots are very sensitive . Since the cashew tree does not do well when transplanted, it is usually recommended that the trees be planted in their permanent locations, spaced 10 to 12 meters apart to allow them to fully mature . For the first 3 years, the seedlings should be supported against wind, provided with adequate shade, and regularly watered to hasten growth . During this time, intercropping is often practiced with fast-growing crops such as legumes, vegetables, tobacco, chilies, cotton, or peanuts  . This allows productive use of the fields until the trees begin to bear fruit in their third year. The trees reach their maximum productivity after 10 years and continue producing fruit for the next 20 years or more . A single tree can produce 200 to 300 fruits in one year . Cashews can also reproduce asexually through vegetative propagation. If a seedling with desirable traits, such as a high percentage of monoecious flowers (allows greater self-pollination), large fruit size, resistance to pests and disease, etc., is found, vegetative propagation allows growers to produce genetic copies of the tree, ensuring that the new trees will carry on the same traits. Many methods of vegetative reproduction are successful with cashews, including side grafting, wedge grafting, softwood grafting, air and ground layering, chip-budding, top-working, and cutting   . As various methods of grafting are further tested and developed, they may become more widely used by farmers and cultivators due to the benefits of being able to select plants with desirable traits as opposed to growing them from seed, which usually results in a wide variety of offspring often unlike their parent plants. Cashew trees require little attention after their first three years. If left alone, they will grow well and continue to produce fruit. Commercial growers may prune the trees, but pruning is usually limited to clearing away the shoots and lowest branches to make harvesting easier. The fields are weeded to protect the trees, especially around the bases of young trees . Fertilizer and manure are both beneficial to cashew trees. Fertilizers should contain nitrogen and phosphate, as well as zinc if the soil is deficient . Mulching helps retain moisture in the soil and prevents weed growth near the trees . Many wild birds, such as this Silver-beaked Tanager, enjoy the sweetness of the cashew apples. Cashews are native to Brazil and were spread to India by the Portuguese in the 1500s . Since then, cashews have been introduced to East Africa, South America, Central America, and the West Indies . The main cultivators of cashews are Vietnam, Nigeria, India, Brazil, and Indonesia . The primary importer of cashews is the United States . Japan, Australia, Canada, Hong Kong, Singapore, and many Middle Eastern countries also purchase large quantities of cashews . The cashew is a tropical or sub-tropical plant that grows between latitudes of 25 degrees north and south . They are most often found growing in coastal areas . They do best in warm, humid weather, and the optimum temperature is 25 degrees Celsius (77 degrees Fahrenheit) . The plants are very susceptible to frost, and temperatures should not fall below 10 degrees Celsius (50 degrees Fahrenheit) . However, cashews are drought tolerant because of their extensive root systems. The best range for rainfall is between 1500 to 2000 mm per year . It is also important that they go through a dry season to stimulate flower growth and fruit production . 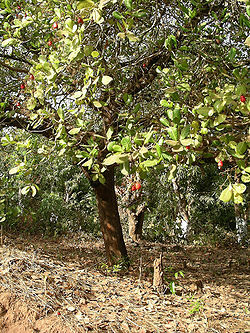 Cashew trees grow in many kinds of soil, even those soil types that would be intolerable to other plants. They prefer deep, well-drained soil that is sandy or loamy and has a pH of 4.5 to 6.5 . They cannot grow in very hard clay, rocky soil, or soil with excess undrained water because it will damage the roots and cause them to rot  . Cashews are pollinated mostly by insects . 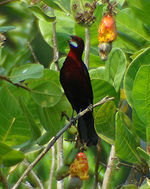 Wild birds, bats, and other animals eat the cashew apples and aid in dispersal . Since the shell of the drupe is so toxic, causing severe burns to those who try to consume it, most animals eat the apple and throw away the drupe, which allows it to germinate, often in a new location . Humans also consume cashews, either raw or as part of other dishes. Common pests that afflict the cashew tree include the tea mosquito, the stem and root borer, the leaf and blossom webber, the leaf minor, the shoot and inflorescence tip borer, and the apple and nut borer, as well as several species of thrips (small insects that afflict fruit trees and other plants)   . These pests can cause severe damage to the trees, especially young ones, by destroying new growth and burrowing inside the trunk, leaves, and fruit. Most pests can be killed using chemical sprays and insecticides . Once the nuts are ripe they naturally fall from the tree. Workers harvest them off the ground, usually going through the fields every day to pick up the apples before they spoil . The apples and drupes are separated and processed. Before the cashew kernels can be eaten, they must be removed from their shells without being contaminated by the caustic oil. The removal from the shell is a long process with many steps. First, the drupes are dried for 1 to 3 days, which allows them to be stored until there are enough nuts to roast . Immediately before roasting, the drupes are soaked in water to prevent the kernels from breaking while being processed . The cashews are usually roasted in pans or other devices with holes in them, allowing the oil to be collected as it drains through the holes. Once roasted, the cashews are covered in sand or sawdust to remove any oil remaining on the shells . Next, the shelling process begins. Cashews are usually shelled manually because of the difficulty in designing machines able to crack open the irregularly-shaped shell without breaking the kernel. While machines are sometimes used, the workers usually break open the shells using wooden hammers . The cashews kernels are separated from the shells and placed on racks in an oven to dry. This causes the testa (seed coat) to become brittle so it can easily be removed by hand . Last, broken and unevenly roasted kernels are sorted out and the good-quality kernels are vacuum-packed for shipping, allowing them to be stored for up to a year . Although the kernels are the main product of cashew trees, many other parts of the tree are utilized as well. The cashew apples, though not exported, are often eaten in countries where the trees are grown. Cashew apples can be eaten raw and are also made into jellies, juices, and syrups. They may be dried, candied, preserved in syrup, or fermented and used to make alcoholic beverages such as brandy, gin, and a wine called Feni that is sold in India  . Both the cashew kernels and cashew apples have many health benefits. The kernels are low in fat compared to some other nuts such as walnuts or peanuts, and they have plenty of healthy fatty acids, B vitamins, protein, potassium, zinc, iron, and fiber . They are also delicious and may be eaten by themselves or used in cooking. They are frequently used in candy and in Thai, Chinese, and Indian foods . The cashew apple is high in vitamin C, with even more than is found in oranges, and is also full of vitamins and minerals . Aside from food, the apples are also used in body care products such as anti-aging cremes, lotions, and shampoos . Other products of the cashew tree are taken from the leaves, wood, bark, and shell. The toxic oil from the shell (cashew nutshell liquid) is collected during the roasting process . It is used to manufacture brake linings, insect repellents, resins, varnishes, and paints  . The wood is used to make furniture and packing crates, and the gum is made into glue . The testa is used in animal feed . The leaves, bark, and kernels may be ground up and used in medicine and insect repellent, and the bark and testa both contain tannins and are used to tan leather . An edible cashew oil is produced from the kernels. This is not the same as cashew nutshell oil; it used in cooking and is similar to olive oil . Parts of the cashew tree are also believed to have medicinal properties. The leaves and bark are made into tea and used to treat diarrhea, dysentery, and colic and to stop bleeding. Various parts of the cashew plant are also used for diabetes, influenza, ulcers, skin disorders, bronchitis, tonsillitis, and other throat problems, and as an antibacterial agent . This whole park is covered by one tree, the Pirangi Cashew Tree. The largest cashew tree covers an entire park, spanning 8,500 square meters . The tree, planted by a fisherman in 1888, is located in the city of Natal in Pirangi do Norte, Brazil . The massive tree has grown so large due to a genetic mutation that causes its branches to grow sideways from the main stem. They grow so quickly that soon they cannot support their own weight and must bend to touch the ground  The branches put down roots wherever they touch the ground, sprouting up again like new trees from those areas . While this gives the appearance of a whole forest of cashew trees, there is really only one tree. The main stem of the tree has five branches. Four of these branches exhibit the abnormal rooting behavior, while the fifth one ends where it touches the ground . The tree is estimated to be the size of 80 normal cashew trees and produces roughly 80,000 fruits in a season . The Pirangi Cashew Tree (called "Cajueiro de Pirangi" in Brazil) is a major tourist attraction for the area that brought in almost 200,000 tourists in 2007 . Tourists can take a guided tour of the park, purchase souvenirs from nearby vendors, and view the top of the tree from a 6-meter-high platform . Although the tree is a source of revenue for the area, it has also been a center of controversy. As its size increased, it began to invade neighboring buildings, and it even grew over part of the highway. In 2000, biologists decided that the tree was too sensitive to handle pruning, but local residents protested when authorities allowed the tree to force them out of their homes and impede traffic . Farmers plant cashews from seedlings like these. ...and then the pedicel enlarges into the cashew apple. Once they ripen and fall from the tree, the cashews are harvested. The cashews are roasted to remove the toxic oil. Workers crack the nuts open, sometimes with a shelling machine like this one. Cashews are hand-removed from the shells and sorted. The good-quality nuts are vacuum-packed and shipped. ...or used to enhance a variety of culinary dishes. The cashew apples are made into cashew apple juice, a common drink in Brazil. Anacardium occidentale L. cashew Natural Resources Conservation Service. United States Department of Agriculture (USDA) PLANTS database. 5/11/09. accessed 5/11/09. Cashew - Anacardium occidentale Mark Rieger. Introduction to Fruit Crops (HORT 3020). University of Georgia. accessed 5/17/09. Raw Cashew Nuts - Are they Really Raw? John Kohler. Living and Raw Foods. 1998. accessed 5/17/09. Cashew AbsoluteAstronomy.com. 2009. accessed 5/17/09. Cashew Apple Anacardium occidentale L. Morton, J. 1987. Cashew Apple. p. 239–240. In: Fruits of warm climates. Julia F. Morton, Miami, FL. 4/22/99. accessed 5/17/09. The Cashew (Anacardium Occidentale, L.). Continued Wilson Popenoe. Manual Of Tropical And Subtropical Fruits. 1920, The Macmillan Company. chestofbooks.com. StasoSphere. 2/21/09. accessed 5/17/09. Fruits Called Nuts Wayne. P. Armstrong. Wayne's Word: An Online Textbook of Natural History. 4/1/09. accessed 5/17/09. Anacardium occidentale L. James A. Duke. 1983. Handbook of Energy Crops. unpublished. Purdue University: Center for New Crops and Plants Products. 12/22/97. accessed 5/17/09. Cultivating Cashew Nuts ARC-Institute for Tropical and Subtropical Crops. accessed 5/18/09. The Ubiquitous Urushiols Norman Goldsten, M.D. Pacific Monograph. 2006. accessed 5/18/09. Cashew (Anacardium Occidentale L) Department of Horticulture, Government of Andhra Pradesh, Public Gardens, Hyderabad. 5/13/09. accessed 5/18/09. Vegetative Propagation Unit Ramadhan Ayub Bashiru, Musa Sungura, and Daniel Millanzi. Naliendele Agricultural Institute (NARI). 2008. accessed 5/18/09. About the Crop- Cashew Government of India, Directorate of Cashewnut & Cocoa Development. 3/31/09. accessed 5/18/09. Growing Cashews: Anacardium occidentale Birgit Bradtke. Tropical Permaculture: Growing Luscious Fruits and Vegetables the Easy Way. 2009. accessed 5/18/09. The Killer Cashew Ray and Suzanne Krueger-Koplin. ToucanGuides.com, Costa-Rica-guide.com. 2004. accessed 5/18/09. Database File for: Cajueiro (Anacardium occidentale) Leslie Taylor. The Healing Power of Rainforest Herbs. 2005. Raintree Nutrition Tropical Plant Database. 1996. accessed 5/18/09. World's largest cashew tree spurs hot debate in Brazil Mnet, Mpelembe Network. 11/21/08. accessed 5/18/09. The largest cashew tree in the world Natal, Rio Grande do Norte, Brazil- A Travel Guide. Natal-Brazil.com. 2009. accessed 5/18/09. This page was last modified on 13 July 2011, at 23:01.